Arlington House, The Robert E. Lee Memorial, formerly named the Custis-Lee Mansion, is a Greek revival style mansion located in Arlington, Virginia, United States that was once the home of Confederate General Robert E. Lee. It overlooks the Potomac River and the National Mall in Washington, D.C. During the American Civil War, the grounds of the mansion were selected as the site of Arlington National Cemetery, in part to ensure that Lee would never again be able to return to his home. The United States has since designated the mansion as a National Memorial. Although the United States Department of the Army controls Arlington National Cemetery, the National Park Service, a component of the United States Department of the Interior, administers Arlington House. The mansion was built on the orders of George Washington Parke Custis, the step-grandson and adopted son of George Washington and only grandson of Martha Custis Washington. Custis became a prominent resident of an area that was then known as Alexandria County, at the time a part of the District of Columbia. Arlington House was built at a high point on a 1,100 acre (445 ha) estate that Custis's father, John Parke Custis, had purchased in 1778 and named "Mount Washington" ("Jacky" Custis died in 1781 at Yorktown after the British surrender). The younger Custis decided to build his home on the property in 1802 following the death of Martha Washington and three years after the death of George Washington. After acquiring the property, Custis renamed it "Arlington" after the Custis family's homestead on the Eastern Shore of Virginia. Almost immediately, Custis began constructing Arlington House on his land. Hiring George Hadfield as architect, he constructed a mansion exhibiting the first example of Greek Revival architecture in America. Custis intended the mansion to serve as a living memorial to George Washington and a place for his collection of George Washington artifacts. Its design included elements similar to those of George Washington's house, Mount Vernon. Construction began in 1803, eleven years after L'Enfant's Plan for the future "Federal City" (later called "Washington City", then Washington D.C.) had designated an area directly across the Potomac River to be the site of the "President's House" (later called the "Executive Mansion", now the White House) and the "Congress House" (now the United States Capitol). Custis located the building on a prominent hill overlooking the Georgetown-Alexandria Turnpike (at the approximate location of the present Eisenhower Drive in Arlington National Cemetery), the Potomac River and the growing Washington City on the opposite side of the river. Using slave labor and materials on site, and interrupted by the War of 1812 (and material shortages after the British burned the American capital city), Custis finally completed the mansion's exterior in 1818. The north and south wings were completed in 1804. The large center section and the portico, presenting an imposing front 140 ft (43 m) long, were finished 13 years later. The house has two kitchens, a summer and a winter. The most prominent features of the house are the 8 massive columns of the portico, each 5 feet (1.5 m) in diameter. Guests at the house included such notable people as Gilbert du Motier, Marquis de Lafayette, who visited in 1824 (see: Visit of the Marquis de Lafayette to the United States). At Arlington, Custis experimented with new methods of animal husbandry and other agriculture. The property also included Arlington Spring, a picnic ground on the banks of the Potomac that Custis originally built for private use but later opened to the public, eventually operating it as a commercial enterprise. Custis married Mary Lee Fitzhugh. Their only child to survive to adulthood was Mary Anna Randolph Custis. Robert E. Lee, whose mother was a cousin of Mrs. Custis, frequently visited Arlington and knew Mary Anna as they grew up. Two years after graduating from West Point, Lieutenant Lee married Mary Anna Custis at Arlington on June 30, 1831. For 30 years Arlington House was home to the Lees. They spent much of their married life traveling between United States Army duty stations and Arlington, where six of their seven children were born. They shared this home with Mary's parents. After their deaths, Mary's parents were buried not far from the house on land that is now part of Arlington National Cemetery. The Custises extensively developed the Arlington estate. Much of the steep slope to the east of the house became a cultivated English landscape park, while a large flower garden with an arbor was constructed and planted south of the house. To the west of Arlington House, tall grass and low native plants led down a slope into a natural area of close-growing trees the Custises called "the Grove." About 60 feet (18 m) to the west of the flower garden, "the Grove" contained tall elm and oak trees which formed a canopy. An informal flower garden was planted beneath the trees and maintained by the Custis daughters. It is not clear when "the Grove" began to be developed, but it was under way by at least 1853. Upon George Washington Parke Custis's death in 1857, he left the Arlington estate to Mary Custis Lee for her lifetime and thence to the Lees' eldest son, George Washington Custis Lee. The estate needed much repair and reorganization, and Robert E. Lee, as executor of Custis's will, took a three-year leave of absence from the Army to begin the necessary agricultural and financial improvements. The will also required the executor to free the slaves on the estate within five years of Custis's death. Robert E. Lee fulfilled this requirement by manumitting the slaves in December 1862. In April 1861, Virginia seceded from the United States. Robert E. Lee resigned his commission in the United States Army on April 20, 1861, and joined the Confederate States Army. With Arlington House on high ground overlooking the capital, the government of the United States knew it must occupy the mansion or be left in an untenable military position. Although unwilling to leave Arlington House, Mary Lee believed her estate would soon be occupied by federal soldiers and left to stay with relatives on May 14, after having been warned by her young cousin William Orton Williams, then serving as aide to General Winfield Scott. 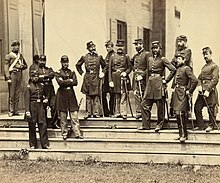 Union Army troops seized and occupied Arlington without opposition on May 24. In June 1862, the 37th United States Congress enacted legislation that imposed a property tax on all land in "insurrectionary" areas of the United States. The 1863 amendments to the statute required these taxes to be paid in person. But Mary Lee, afflicted with severe rheumatoid arthritis and behind Confederate lines, could not pay the tax in person. The Arlington estate was seized for nonpayment of taxes. It was auctioned off on January 11, 1864, and the U.S. government won the property for $26,800 ($438,646 today). During the war, Union Army troops cut down many of the trees on the Arlington estate, especially those to the north and east of Arlington House in and near Fort Whipple (north of the house) and Arlington Springs (near the Potomac River). However, a number of large trees remained, particularly those in a forested area (now known as Arlington Woods) west of the house. By early 1864, the military cemeteries of Washington, D.C., and Alexandria, Virginia, were rapidly filling with war dead. Quartermaster General of the United States Army Montgomery C. Meigs proposed using 200 acres (81 ha) of the Arlington estate as a cemetery. United States Secretary of War Edwin M. Stanton approved the establishment of a military cemetery on June 15, 1864, creating Arlington National Cemetery. Meigs believed that since Lee had committed treason in deciding to fight against the Union, denying Lee use of the mansion after the war was a rough form of justice. Meigs decided that a large number of burials should occur close to Arlington House to render it unlivable. Officers were to be buried next to the main flower garden south of the house, and the first burial occurred here on May 17. Meigs ordered that additional burials commence immediately on the grounds of Arlington House in mid-June. When Union officers bivouacked in the mansion complained and had the burials temporarily stopped, Meigs countermanded their orders and had another 44 dead officers buried along the southern and eastern sides of the main flower garden within a month. In September 1866, the remains of 2,111 Union and Confederate soldiers who died at the First Battle of Bull Run, Second Battle of Bull Run, and along the Rappahannock River were buried on the former site of "the Grove", southeast of the mansion, beneath the Civil War Unknowns Monument. Robert E. Lee made no attempt to visit or restore his title to Arlington before his death in 1870. Mary Lee died in 1873, having visited the house only one more time, a few months before her death. Too upset at its condition, she refused to enter and left after just a few moments. In April 1874, Robert E. Lee's eldest son, George Washington Custis Lee, filed suit against the United States government in a Virginia circuit court to regain his property. Custis Lee was a major general in the Civil War and was captured by Union forces at the Battle of Sailor's Creek VA on April 6, 1865 (see David Dunnels White). A jury found in favor of Custis Lee, leading to extensive appeals by both parties. In 1882, the Supreme Court of the United States ruled in favor of Lee in United States v. Lee, 106 U. S. 196. The court, by a 5-4 majority, found that the estate had been "illegally confiscated" in 1864 and ordered it returned. But Lee was less interested in obtaining the estate than he was in a cash compensation for its value. After several months of difficult negotiations, Lee and the federal government settled on a sale price of $150,000 ($4,033,393 in 2018 dollars). Congress enacted legislation funding the purchase on March 3, 1883; Lee signed over the title on March 31; and the title transfer was recorded on May 14, 1883. In 1920, the Virginia General Assembly changed the name of Alexandria County to Arlington County to end ongoing confusion between Alexandria County and the independent city of Alexandria. The name Arlington was chosen to reflect the presence of the Arlington estate. On March 4, 1925, the 68th United States Congress enacted Public Resolution 74, which authorized the restoration of the Lee Mansion in the Arlington National Cemetery, Virginia. The War Department then began to restore Arlington House, and the Department of the Army continues to manage over half of the original plantation's 1,100 acres, as Arlington National Cemetery. However, for several years after Congress enacted the authorizing legislation, the War Department, which was responsible for managing the house and grounds, largely ignored the legislation. Contradicting the authorizing legislation, the Department, largely at the insistence of Charles Moore, the director of the United States Commission of Fine Arts, furnished and interpreted the Mansion to “the first half of the republic.” This decision was based, in part, on the popularity of the Colonial Revival movement which was still popular in 1925. The Mansion was restored to the period of George Washington Custis, and no furniture manufactured after 1830 was accepted. This approach negated Lee's role and presence at Arlington. In 1955, the 84th United States Congress enacted Public Law 84-107, a joint resolution that designated the manor as the "Custis-Lee Mansion" as a permanent memorial to Robert E. Lee. The resolution directed the United States Secretary of the Interior to erect on the premises a memorial plaque and to correct governmental records to bring them into compliance with the designation, "thus ensuring that the correct interpretation of its history would be applied". Gradually the house was furnished and interpreted to the period of Robert E. Lee as specified in the original legislation. The National Park Service received jurisdiction over the building and some 28 acres of adjacent gardens (distinguished from the cemetery) beginning June 10, 1933. In 1972, the 92nd United States Congress enacted Public Law 92-333, an Act that amended Public Law 84-107 to designate the manor as "Arlington House, The Robert E. Lee Memorial". One of the lesser known histories about Arlington House concerns the Gray family, who helped to preserve the legacy of George Washington Park Custis as well as the Lee Family. Selina Norris Gray, the daughter of Leonard and Sally Norris, was a second-generation Arlington slave. In 1831, Selina married Thornton Gray, a fellow Arlington slave, and eventually had eight children who grew up at Arlington. With the onset of the Civil War, the Lee family had to evacuate their home before the Union troops came and occupied the property. Even though Selina was a personal maid to Mrs. Lee, she and her family were left behind; however, before leaving, Mrs. Lee left the house keys to Selina and the responsibility to protect the treasures of the home. Several of these treasures included cherished family heirlooms that had once belonged to Mrs. Lee's great-grandmother, Martha Custis Washington, and President George Washington. Within months of Union Army General Irvin McDowell occupying the home in 1861, Selina realized that several precious heirlooms were missing due to soldiers looting the property. When she discovered that some of the Washington relics had also disappeared, she promptly provided a list of the missing objects to General McDowell and convinced him that the significance of the collection required his involvement. He first secured the attic and basement areas to prevent further theft, then had the remaining Lee heirlooms shipped to the Patent Office in Washington, D.C for safekeeping. While Selina is credited with saving the heirlooms and treasures of Arlington House, her children later on are credited with helping to restore the home as well as provide accurate details about the layout of the home, personal stories of the Lee family, and help preservationists in the early twentieth century. During major restorative efforts to Arlington House from 1929 to 1930, the Gray family made another important contribution to the history of Arlington County and the nation. Four of Selina and Thornton's daughters provided crucial details about the house and its furnishings, and their input proved vital to the authenticity of the project. In 2014, the National Park Service acquired a rare photograph of Selina. In 1995, officials of the United States Department of the Interior and the United States Department of the Army signed an agreement to transfer from Arlington House, The Robert E. Lee Memorial, to the Army a part of Arlington Woods, which was located in Section 29 of the NPS at Arlington National Cemetery between Arlington House and Fort Myer. The property transfer, which involved 12 acres (4.9 ha) of NPS land, was intended to enable the Cemetery to increase its space for burials. Environmentalists expressed concerns that the agreement would result in the partial destruction of the 24 acres (9.7 ha) remnant of an historically important stand of native trees. Nevertheless, Congress enacted legislation in September 1996 authorizing the transfer. On June 5, 2013, after reviewing 100 public comments that it had received on a draft environmental assessment (EA) for the Cemetery expansion project, the United States Army Corps of Engineers released a final EA and a signed Finding of No Significant Impact (FONSI) for the project. The final EA stated that, of the 905 trees to be removed, 771 trees were healthy native trees that had diameters between 6 and 41 inches. The project would remove approximately 211 trees from a less than 2.63 acres (1.06 ha) area containing a portion of a 145-year-old forest that stood within the property boundaries of a historic district that a National Register of Historic Places nomination form for Arlington House had described in 1966. About 491 trees would be removed from an area of trees that was approximately 105 years old. At a public hearing on July 11, 2013, the National Capital Planning Commission approved the site and building plans for the project. From 2003 to 2007, the National Park Service conducted an archeological excavation of two outbuildings that once held Arlington House's slave quarters. In 2009, the Park Service published reports that described the history of the slave quarters and the findings of the excavations, as well as proposals for the restoration of the quarters. East façade of north slave quarters during restoration (2011). From 2007 through 2013, Arlington House underwent its first renovation since 1925. During that period, the National Park Services placed the House's furnishings on display at the Friendship Hill National Historic Site near Point Marion, Pennsylvania. The Park Service held a rededication ceremony after it had completed the renovation and returned the furnishings to the House. Arlington House suffered significant damage in the 2011 Virginia earthquake, requiring the closure of the back halls and upper floor pending an architectural assessment. On July 17, 2014, philanthropist David Rubenstein donated $12.5 million to the National Park Foundation (the arm of the National Park Service which raises funds through private contributions) to rehabilitate Arlington House, its outbuildings, and grounds. The 30-month project is intended to restore the mansion, buildings, and grounds to the way they looked in 1860. The project will repair the earthquake-damaged foundation, and add new interior lighting and a modern climate-control system. National Park Service officials said they are likely to close Arlington House and the slave quarters for several months in 2016, during which most of the work will be done. In 1919, a replica was built for the short-lived Lanier University in Atlanta, designed by architect A. Ten Eyck Brown. It is still standing at 1140 University Drive NE, and houses the Ben H. Zimmerman Religious School and the Canterbury School. Arlington Hall, a two-thirds scale replica of Arlington House, was built in 1939 in Robert E. Lee Park in Dallas, Texas. The façade of the Old Administration Building in Arlington National Cemetery resembles that of Arlington House. The building is 500 feet (150 m) west of Arlington House. ^ (1) "Arlington House, The Robert E. Lee Memorial". National Register of Historic Places: NPGallery. National Park Service. Archived from the original on September 9, 2016. Retrieved September 4, 2016. (2) Seagraves, Anna; Fuqua, Ann; Veloz, Nicholas, George Washington Memorial Parkway, National Capital Region, National Park Service (January 15, 1980). "Arlington House, The Robert E. Lee Memorial". United States Department of the Interior: National Park Service: National Register of Historic Places — Nomination Form for Federal Properties. National Park Service. Archived from the original on September 4, 2016. Retrieved September 4, 2016. ^ (1) "Arlington House Historic District". National Register of Historic Places Program. National Park Service. Archived from the original on September 4, 2016. Retrieved September 4, 2016. (2) Smith, Kathryn Gettings (National Park Service) (December 31, 2013). "National Register of Historic Places Registration Form: Arlington House Historic District [2013 Boundary Increase & Additional Documentation]" (PDF). United States Department of the Interior: National Park Service. Archived from the original (PDF) on July 29, 2014. Retrieved September 3, 2016. ^ "Today in History: May 13: Arlington National Cemetery". American Memory. Library of Congress. Retrieved August 22, 2011. ^ (1) Rudy, p. 15. ^ a b Smith, Adam; Tooker, Megan; Enscore, Susan (U.S. Corps of Engineers) (January 31, 2013). "National Register of Historic Places Registration Form: Arlington National Cemetery Historic District" (PDF). United States Department of the Interior: National Park Service. Archived from the original (PDF) on September 4, 2014. Retrieved September 3, 2016. ^ Hanna & October 2001, p. 54. ^ a b Hanna & October 2001, p. 59. ^ Fellman 2003, pp. 195-200. ^ a b c Arlington National Cemetery 2009, p. 77. ^ Chase 1930, p. 173. ^ McCaslin 2004, pp. 79-80. ^ a b c d Atkinson 2007, p. 25. ^ Perry 2010, p. 125. ^ a b Chase 1930, p. 176. ^ Arlington 2000, p. 77. ^ a b Poole 2009, pp. 54-55. ^ Poole 2009, p. 55. ^ Hanna & October 2001, pp. 77-78, 87-88. ^ McCaslin 2004, p. 82. ^ Peters 1986, p. 142. ^ Hanna & October 2001, p. 88. ^ a b c Hanna & October 2001, p. 86. ^ a b c d Atkinson 2007, p. 26. ^ Randall 1913, p. 35. ^ Chase 1930, p. 191. ^ Meyer 1998, p. 140. ^ Amar 1987, p. 1512. ^ Grant 1996, p. 203, fn 254. ^ a b Holt 2010, p. 336. ^ Fernandez 2013, p. 63. ^ Public Resolution 74, 68th Congress, Session II, Chapter 562: "Joint Resolution Authorizing the restoration of the Lee Mansion in the Arlington National Cemetery, Virginia, March 4, 1925", cited in: Smith, Kathryn Gettings (National Park Service) (December 31, 2013). "National Register of Historic Places Registration Form: Arlington House Historic District [2013 Boundary Increase & Additional Documentation]" (PDF). Section 8, p. 105. United States Department of the Interior: National Park Service. Archived from the original (PDF) on July 29, 2014. Retrieved September 3, 2016. ^ "Public Law 84-107: JOINT RESOLUTION: Dedicating the Lee Mansion in Arlington National Cemetery as a permanent memorial to Robert E. Lee" (PDF). Washington, D.C.: United States Government Publishing Office. June 29, 1955. Archived from the original (PDF) on September 4, 2016. Retrieved September 3, 2016. SEC. 3. That the magnificent manor house situated in its prominent position at the brow of a hill overlooking the Potomac River in Arlington National Cemetery, and popularly known as Lee Mansion, be officially designated as the Custis-Lee Mansion, so as to give appropriate recognition to the illustrious Virginia family in which General Lee found his wife, and that the Custis-Lee Mansion is hereby dedicated as a permanent memorial to Robert E. Lee, and the Secretary of the Interior is authorized and directed to erect on the aforesaid premises a suitable memorial plaque, and to correct governmental records to bring them into compliance with the designation authorized by this joint resolution. ^ United States of America. National Park Service. Arlington House The Robert E. Lee Memorial. Washington D.C: US Department of the Interior, 1985. ^ "Public Law 92-333: AN ACT: To restore to the Custis-Lee Mansion located in the Arlington National Cemetery, Arlington, Virginia, its original historical name, followed by the explanatory memorial phrase, so that it shall be known as Arlington House, The Robert E, Lee Memorial" (PDF). Washington, D.C.: United States Government Publishing Office. June 30, 1972. Archived from the original (PDF) on September 4, 2016. Retrieved September 4, 2016. ^ a b "The Gray Family". Arlington House, The Robert E. Lee Memorial. National Park Service. Retrieved September 26, 2014. ^ a b "Life of the Gray Family at Arlington House". Black History Museum of Arlington. Retrieved January 28, 2018. ^ Mary Beth Griggs. "Rare Photo of Robert E. Lee's Slave Acquired by National Park Service". Smithsonian. 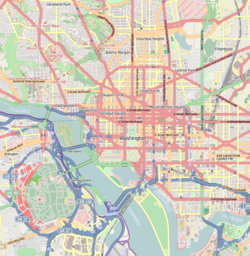 ^ (1) "Interactive map of Arlington National Cemetery showing Section 29 and Future Expansion Site". Arlington National Cemetery. Archived from the original on 2015-04-18. Retrieved 2012-12-26. ^ Hanna, Jennifer (October 2001). "Arlington House: The Robert E. Lee Memorial: Cultural Landscape Report: History" (PDF). Cultural History Program. Washington, D.C.: United States Department of the Interior: National Park Service: National Capital Region. 1: 169. Archived from the original (pdf) on 2012-12-24. Retrieved 2012-12-24. ^ (1) Gearan, Anne (1995-07-03). "Admirers of Lee Upset by Cemetery Expansion Plan". News Archive. Associated Press. Archived from the original on 2013-03-20. Retrieved 2013-03-20. (2) Nakashima, Ellen (1995-07-06). "Environmentalists Fear Effects of Expanded Arlington Cemetery". Metro. The Washington Post. p. B3. Retrieved December 29, 2012. ^ "XXVIII—General Provisions: Subtitle C—Land Conveyances: Section 2821(a). Transfer of lands, Arlington National Cemetery, Arlington, Virginia (110 Stat. 2791-2792)" (pdf). Public Law 104-201: National Defense Authorization Act for Fiscal Year 1997, Division B: Military Construction Authorization Act for Fiscal Year 1997. United States Government Printing Office. 1996-09-23. Retrieved 2012-12-24. (a) REQUIREMENT FOR SECRETARY OF INTERIOR TO TRANSFER CERTAIN SECTION 29 LANDS.—(1) Subject to paragraph (2), the Secretary of the Interior shall transfer to the Secretary of the Army administrative jurisdiction over the following lands located in section 29 of the National Park System at Arlington National Cemetery, Virginia: (A) The lands known as the Arlington National Cemetery Interment Zone. (B) All lands in the Robert E. Lee Memorial Preservation Zone, other than those lands in the Preservation Zone that the Secretary of the Interior determines must be retained because of the historical significance of such lands or for the maintenance of nearby lands or facilities. ^ (1) Arlington National Cemetery Millennium Project Final Environmental Assessment (PDF). Norfolk, Virginia: United States Army Corps of Engineers Norfolk District. June 2013. Archived from the original (pdf) on 2013-07-17. Retrieved 2013-07-17. (2) Federoff, David (2013-06-05). "Finding of No Significant Impact Millennium Project, Arlington National Cemetery, Arlington, Virginia" (pdf). Norfolk, Virginia: United States Army Corps of Engineers Norfolk District. Archived (PDF) from the original on 2013-07-17. Retrieved 2013-07-16. ^ (1) "Appendix J: Comments on Revised Millennium EA: Public Comment Period 12 March 2013 to 12 April 2013" (PDF). Arlington National Cemetery Millennium Project Final Environmental Assessment, June 2013. Archived (PDF) from the original on 2013-07-17. Retrieved 2013-07-17. (2) Sullivan, Patricia (2012-06-12). "Army Corps says go ahead with Arlington cemetery expansion". Post Local. The Washington Post. Archived from the original on 2013-07-18. Retrieved 2013-07-18. ^ a b c "Impacts to Trees". Arlington National Cemetery Millennium Project Final Environmental Assessment (PDF). Norfolk, Virginia: United States Army Corps of Engineers Norfolk District. June 2013. pp. 114–115. Archived from the original (pdf) on 2013-07-17. Retrieved 2013-07-17. ^ Tree Tag #1026 (Black Cherry, Prunus serotina (PDF). Archived from the original (PDF) on 2013-07-17. in Arlington National Cemetery Millennium Project Final Environmental Assessment, June 2013, Appendix I (Tree Inventory and Analysis), p. 13. ^ (1) Figure A: Millennium Project with Tree Ages and NPS Property (PDF). Arlington National Cemetery Millennium Project Final Environmental Assessment. Norfolk, Virginia: United States Army Corps of Engineers Norfolk District. June 2013. p. 4. Archived from the original (pdf) on 2013-07-17. Retrieved 2013-07-17. (2) Figure 38: Existing conditions, impacts, and contributing areas of Arlington House: Historic Landscape Effects: ANC Boundary Wall and Arlington House Forest (PDF). Arlington National Cemetery Millennium Project Final Environmental Assessment. Norfolk, Virginia: United States Army Corps of Engineers Norfolk District. June 2013. p. 133. Archived from the original (pdf) on 2013-07-17. Retrieved 2013-07-17. (3) Seagraves, Anna; Fuqua, Ann; Veloz, Nicholas, George Washington Memorial Parkway, National Capital Region, National Park Service (1980-01-15). "Arlington House, The Robert E. Lee Memorial" (PDF). United States Department of the Interior: National Park Service: National Register of Historic Places — Nomination Form for Federal Properties. Richmond, Virginia: Virginia Department of Historic Resources. p. 8. Archived (PDF) from the original on 2013-07-17. Retrieved 2013-07-17. ^ (1) Young, Deborah B. (2013-07-11). "Commission Action: Millennium Project, Arlington National Cemetery, Arlington, VA (NCPC File Number 7457)" (PDF). Washington, D.C.: National Capital Planning Commission. Archived from the original (pdf) on 2013-07-17. Retrieved 2013-07-16. (2) "Executive Director's Recommendation: Commission Meeting: July 11, 2013: Millennium Project, Arlington National Cemetery, Arlington, VA (NCPC File Number 7457)" (PDF). Washington, D.C.: National Capital Planning Commission. 2013-07-11. Archived from the original (pdf) on 2013-07-17. Retrieved 2013-07-16. ^ (1) "Slave Quarters". Arlington House, The Robert E. Lee Memorial. United States Department of the Interior: National Park Service. Archived from the original on June 21, 2015. Retrieved 2016-09-05. (2) "Historic slave quarters being restored". arlingoncemetery.net. November 27, 2003. Archived from the original on August 18, 1014. Retrieved September 6, 2016. (1) Kelley, Sarah, Northern Virginia Journal (November 23, 2003). "Dig May Tell Story Of Arlington Slaves: A Project To Restore The Historic Mansion In Virginia Could Uncover Artifacts". Orlando, Florida: Orlando Sentinel. Archived from the original on September 6, 2016. Retrieved September 6, 2016. ^ (1) Fisher, Charles; Randl, Chad; Staveteig, Karen (December 8, 2009). "Arlington House, The Robert E. Lee Memorial: North Dependency: Historic Structure Report". Washington DC: United States Department of the Interior: National Park Service: Technical Preservation Service. Retrieved September 5, 2016. At Internet Archive. (2) Fisher, Charles; Randl, Chad; Staveteig, Karen (December 8, 2009). "Arlington House, The Robert E. Lee Memorial: South Dependency: Historic Structure Report". Washington DC: United States Department of the Interior: National Park Service: Technical Preservation Service. Retrieved September 5, 2016. At Internet Archive. ^ "Arlington House Revisited: Prominent landmark to undergo renovations as a means to preserve its rich history". Arlington Connection. November 27, 2006. Archived from the original on September 2, 2015. Retrieved September 5, 2016. ^ (1) "Furniture Exhibit Unveiled at Friendship Hill NHS". Friendship Hill National Historic Site. United States Department of the Interior: National Park Service. April 23, 2007. Archived from the original on August 1, 2015. Retrieved 2016-09-05. (2) "Arlington House Furnishings at Friendship Hill". Friendship Hill National Historic Site. United States Department of the Interior: National Park Service. Archived from the original on August 25, 2007. Retrieved 2016-09-05. ^ "Arlington House Re-Dedication". CSPAN. April 20, 2013. Archived from the original (video) on September 10, 2015. Retrieved September 5, 2016. ^ (1) "Arlington House, The Robert E. Lee Memorial". United States Department of the Interior: National Park Service. August 30, 2011. Archived from the original on September 27, 2011. Retrieved September 26, 2011. Due to earthquake damage at Arlington House, the second floor and back hall are closed. All other areas will remain open. (2) "Historic Arlington House Damaged in Earthquake". ARLnow.com. November 2, 2011. Archived from the original on November 11, 2011. Retrieved September 6, 2014. ^ Ruane, Michael E. (July 17, 2014). "Robert E. Lee's Arlington Mansion Gets $12 Million Donation From David Rubenstein". The Washington Post. Retrieved July 17, 2014. ^ Davis & Davis 2011, p. 138. ^ Gerem 2004, p. 426. Amar, Akhil Reed (June 1987). "Of Sovereignty and Federalism". Yale Law Journal: 1425–1520. Heidler, David Stephen; Heidler, Jeanne T.; Coles, David J., eds. (2000). "Arlington". Encyclopedia of the American Civil War: A Political, Social, and Military History, Volume 1. New York: W.W. Norton & Co. ISBN 9781576070666. Pencak, William, ed. (2009). "Arlington National Cemetery". Encyclopedia of the Veteran in America. Santa Barbara, Calif.: ABC-CLIO. ISBN 9780313340086. Atkinson, Rick (2007). Where Valor Rests: Arlington National Cemetery. Washington, D.C.: National Geographic Society. ISBN 9781426200892. Chase, Enoch Aquila (1930). "The Arlington Case: George Washington Custis Lee Against the United States of America". Records of the Columbia Historical Society: 207–233. Davis, Ren; Davis, Helen (2011). Atlanta Walks: A Comprehensive Guide to Walking, Running, and Bicycling the Area's Scenic and Historic Locales. Atlanta: Peachtree Publishers. ISBN 9781561455843. Fellman, Michael (2003). The Making of Robert E. Lee. Baltimore, Md. : Johns Hopkins University Press. ISBN 0679456503. Fernandez, Martin (2013). Best Bike Rides Washington, D.C.: Great Recreational Rides in the Metro Area. Guilford, Conn.: Globe Pequot Press. ISBN 9780762780815. Gerem, Yves (2004). A Marmac Guide to Dallas. Gretna, La. : Pelican Publishing Co. ISBN 1565544072. Grant, Eric (Fall 1996). "A Revolutionary View of the Seventh Amendment and the Just Compensation Clause". Northwestern University Law Review: 144–242. Hanna, Jennifer (October 2001). "Cultural Landscape Report: History: Volume 1" (PDF). Arlington House: The Robert E. Lee Memorial. Washington, D.C.: National Park Service: United States Department of the Interior. Archived from the original (PDF) on September 5, 2016. Retrieved September 5, 2016. Holt, Dean W. (2010). American Military Cemeteries. Jefferson, N.C.: McFarland & Co. ISBN 9780786440238. McCaslin, Richard B. (2004). Lee in the Shadow of Washington. Baton Rouge, La. : Louisiana State University Press. ISBN 0807126969. Meyer, Randy L. (Fall 1998). "The Supreme Court's Analysis in Idaho v. Coeur D'Alene Tribe of Idaho: Is the Young Exception to the Eleventh Amendment Inapplicable to Indian Tribe Claims?". Toledo Law Review: 131–182. Peters, James Edward (1986). Arlington National Cemetery: Shrine to America's Heroes. Bethesda, Md. : Woodbine House. ISBN 1890627143. Perry, John (2010). Lee: A Life of Virtue. Baton Rouge: Louisiana State University Press. Poole, Robert M. (2009). On Hallowed Ground: The Story of Arlington National Cemetery. New York: Walker & Co. ISBN 9780802715487. Randall, J.G. (1913). The Confiscation of Property During the Civil War. Indianapolis: Mutual Printing and Lithographing Co.
Rudy, William George (2010). Interpreting America's First Grecian Style House: the Architectural Legacy of George Washington Parke Custis and George Hadfield. Masters Thesis. College Park, Maryland: University of Maryland. Archived from the original on March 7, 2016. Retrieved September 3, 2016. United States Army Corps of Engineers, Norfolk District (March 2013). Arlington National Cemetery Millennium Project Environmental Assessment (PDF). Norfolk, Virginia. Archived from the original (PDF) on March 12, 2013. Retrieved March 12, 2013. United States Department of the Interior (2003). The National Parks: Index 2001-2003. Washington, D.C.: U.S. Department of the Interior. Wikimedia Commons has media related to Arlington House, The Robert E. Lee Memorial. "Virtual Museum Exhibit: Arlington House, The Robert E. Lee Memorial". Museum Management Program. National Park Service: United States Department of the Interior. Archived from the original on November 23, 2007. Retrieved September 5, 2016.